If a picture is worth a thousand words, this one must be worth a thousand dollars. This is China today. 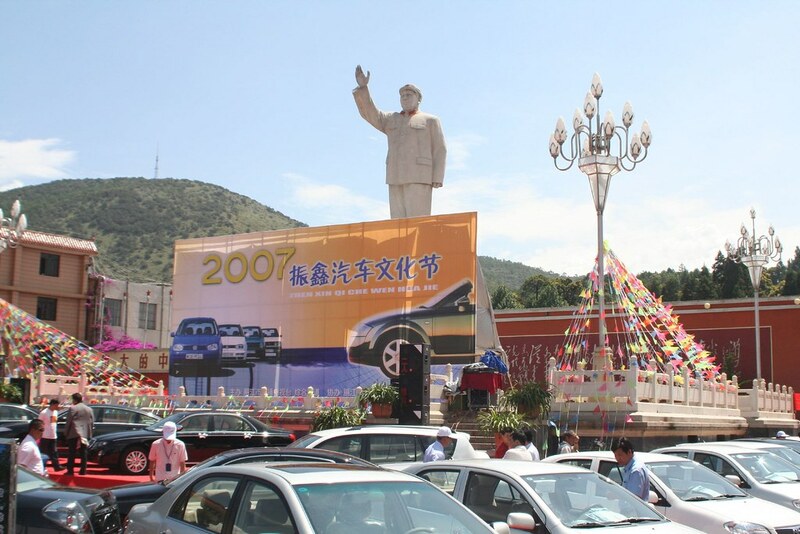 New cars being sold at the foot of Chairman Mao while “Life in the Fast Lane” blasts from stereos. Just a few decades ago in communist China it was good to be a “comrade”, an equal ally in the communist fight. Good comrades put party first and kept a sharp eye out for those left leaning “capitalist roaders” – people with bourgeois tendencies who might derail the communist fight. My how things have changed. Today, comrade is used by gay males to refer to one another. (Homosexuality was removed from the official list of mental disorders in 2001, in case you were wondering.) And the capitalist roader is apparently no longer the enemy. While Mao remains a national hero, Deng Xiaoping’s portrait also graces many walls. It was Deng who brought economic reform to the nation’s various sectors, trying to maintain a balance between socialist values and market economy. In the early days, these reforms lifted millions out of poverty and made him a hero to many. Deng famously said, “to get rich is glorious”, and many people in Chinese are getting quite rich. Unfortunately, as is the case with many economies, this rising tide is not lifting all boats. The egalitarian ideals of the Chairman are long gone and the gap between the “haves” and “have nots” is clearly widening. You can see poverty and Prada (the real Prada, not just a fake) on the same block. Dave and I are still trying to understand how exactly a “socialist market economy” works. Somewhere down the road, one of these will surely come out on top. And while the government continues to slowly loosen controls and become the latest darling of foreign investment, it seems to want to maintain tight control over all else – including its people.